During a meeting of the Synod of Bishops on Tuesday, June 19, 2013, presided over by His Eminence Metropolitan Hilarion of Eastern America and New York, First Hierarch of the Russian Orthodox Church Outside of Russia, its members heard a report by Protopriest Andrei Sommer, Senior Priest of the Synodal Cathedral of Our Lady “of the Sign” and Vice President of the Synodal Youth Department, on youth ministry in the Russian Church Abroad. 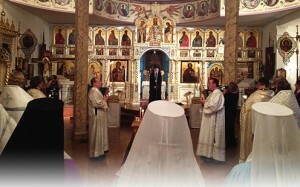 The Synod gave its blessing for the organization of the 13th All-Diaspora Russian Orthodox Youth Conference to be scheduled in San Francisco, CA, in June, 2014. The Synod also decided to concurrently convene a regular Council of Bishops of the Russian Orthodox Church Outside of Russia in that city to mark the 20th anniversary of the canonization of St John of Shanghai, Miracle-Worker of San Francisco. The Council Organizing Committee will consist of His Eminence Archbishop Kyrill of San Francisco and Western America, Secretary of the Synod of Bishops; His Eminence Archbishop Gabriel of Montreal and Canada, and His Grace Bishop Theodosius of Seattle, Vicar of the Western American Diocese. The archpastors also discussed matters pertaining to the restoration of the Synod residence in New York, the Russian Ecclesiastical Mission in Jerusalem and the Orthodox Palestine Society. 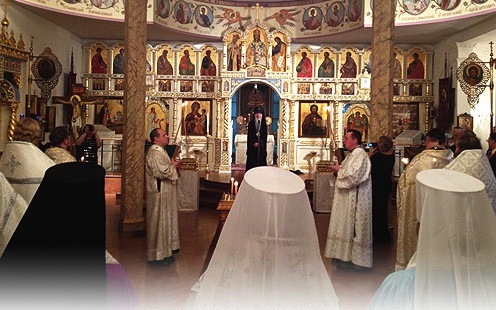 That evening, His Beatitude Metropolitan Tikhon of All America and Canada, Primate of the Orthodox Church in America; Metropolitan Hilarion; His Eminence Archbishop Justinian of Naro-Fominsk, Administrator of the Patriarchal Parishes in the US; and a host of clergymen performed a pannikhida to mark the 400th anniversary of the Romanov Dynasty. Present at the service were Igor Leonidovich Golubovsky, Russian Consul General in New York, many members of Russian society and other worshipers. The Synodal Choir sang magnificently under the direction of Peter Fekula. After the sixth song of the canon, His Eminence Archbishop Mark of Berlin and Germany delivered a sermon. On Wednesday, the Synod members heard reports by Protopriest Serafim Gan; Priest Joakim Provatakis, Director of the Synod’s candle-making operation; Jurisconsult Nicholas A. Ohotin and Treasurer Eugene I. Grigoriak. Other administrative matters were also discussed, as well as intercessions by the archpastors for ecclesiastical awards to their clergy and laity. The next meeting of the Synod of Bishops is scheduled for the official celebration of the 400th anniversary of the Romanov Dynasty to be held in Toronto, Canada, on September 4-8.